In this post, I will like to introduce a player for you to consider signing in Master League, Giovinco from Juventus! Currently my Master League team in Juventus. Giovinco has been one of the stars in my team, and I will like to recommend him to fellow players who might be looking for a AMF in PES. Giovinco is 22 years old and starts off with a rating of 79. After 3 seasons, his rating grew to 84 in my team. He is a small and fast player, a fantastic dribbler who possess 4 dribbling skill cards. He is an excellent passer of the ball as well. 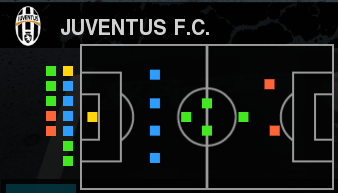 Juventus plays with a 4-4-2 diamond formation. In the first season, I play Diego at the top of the diamond. However, Giovinco proved too good to be benched and now he starts in the AMF position at the top of the diamond. His best position is in AMF. I recommend for players to dribble with him towards goal and make a killer pass to your strikers. Giovinco has the in game intelligence to make runs into space too and is able to score decent goals, although his accuracy can be improved. One thing to note is his lack of height. He will lose the majority of his headers. Defenders will outmuscle him easily, so we will have to use his speed and trickery to go round the defenders. Here is a short video of his stunning skills. His good i first noticed him in 2009 by accident when looking for speedy fast players. Grows very well got him up to 91 this year atleast. Yes Giovinco will tend to lose out to physically stronger players so we have to use his speed to burst past them. Thanks for your input! as for pes2011, i recommend veron! he is scoring like crazy in my team, playing as AMF.